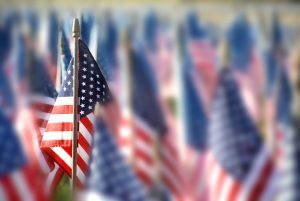 During the weekend of Saturday, November 10 and Sunday, November 11, McKinney area families can gather at Veterans Memorial Park for several Veterans Day celebrations. On Saturday, there will be a special day with a missing man formation flyover, patriotic music, and a parading of the colors, all to help families honor veterans. You can return for a sundown ceremony on Sunday evening, which will feature a reading of the names listed on the Wall Of Honor. Your McKinney, TX dentist is proud to serve members of the community. If you need to have a dental problem checked, or if you want to arrange a routine dental exam to make sure your smile is healthy, we can arrange a visit and provide you with a modern, friendly patient experience. The first Veterans Day celebration at Veterans Memorial Park will take place on Saturday, November 10 at 11 am. The sundown ceremony will be held on Sunday, November 11 at 5:26 pm. Veterans Memorial Park is located at 6053 Weiskopf Ave, McKinney, TX. On Saturday, you can enjoy several events to honor veterans, including a parading of the colors, and a missing man formation flyover, with patriotic music playing. Sunday’s sundown ceremony will include a reading of the names displayed on the Wall Of Honor, and the playing of taps. At Illume Dental, McKinney area families can look forward to dedicated smile care during each visit! Our practice is proud to help patients deal with a variety of oral health concerns, while also welcoming people who seek preventive care. For more information, call Illume Dental in McKinney, TX, today at (469) 301-1255.